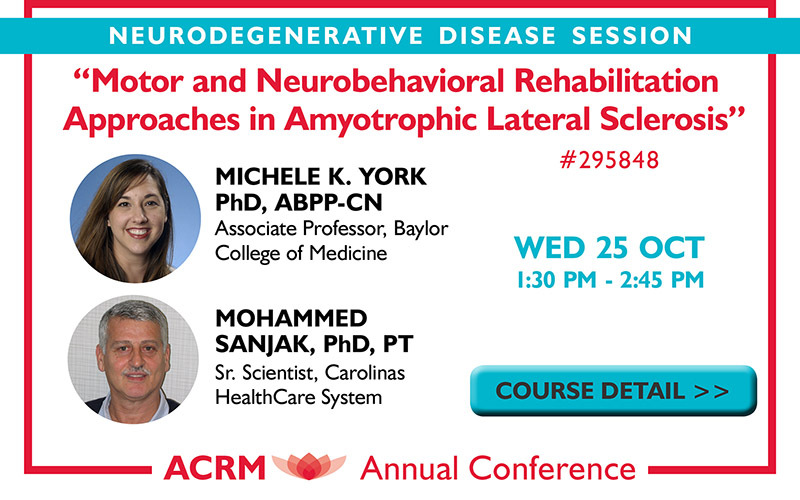 This interactive symposium will discuss a multi-disciplinary rehabilitation approach which integrates the latest research advances for motor rehabilitative strategies and treatments with the non-motor cognitive and psychiatric aspects of Amyotrophic Lateral Sclerosis (ALS). Promising research and emerging physical rehabilitation strategies will be discussed including studies examining role of exercise, motor and sensory control, motor fatigue and motor stamina in ALS. The neurobehavioral aspects of ALS will be reviewed with particular attention placed on treatments and strategies for pseudobulbar affect. Attendees will be asked to participate in a group discussion on how these research findings can translate into multi-disciplinary approaches in clinical practice. Dr. Michele York, PhD, ABPP-CN, is an Associate Professor and the Section Head of Neuropsychology at Baylor College of Medicine in Houston, TX. She is also the Neuropsychologist for the Parkinson’s Disease Research Education and Clinical Center at the Michael E. DeBakey Veterans Affairs Medical Center. Michele received her M.A. (’96) and her Ph.D. (’98) in Clinical Psychology from Vanderbilt University. Michele is a new member of ACRM since 2014, and is co-chair of the Education Committee for the Neurodegenerative Diseases Networking Group. Dr. York provides neuropsychological services to a wide variety of patient populations including Alzheimer’s disease and related disorders, Parkinson’s disease, Amyotrophic lateral sclerosis, ischemic vascular disease, and multiple sclerosis. Dr. York is involved in ongoing research projects include cognitive rehabilitative strategies for Parkinson’s disease and ALS patients, the longitudinal study of Alzheimer’s disease, and the cognitive and behavioral effects of deep brain stimulation for Parkinson’s disease. Mohammed S. Sanjak, PhD, PT, is senior scientist at the Neurosciences Institute – Department of Neurology Charlotte at Carolinas HealthCare System, and an Adjunct Associate Professor in the Department of Kinesiology, UNC-Charlotte. He is PhD-trained exercise physiologist with qualifications as a licensed practicing physical therapist who treats neuromuscular and ALS patients at the Neurosciences Institute – Department of Neurology Charlotte, Charlotte. His research experience has focused in large part on understanding the pathophysiology of motor function in ALS patients. Dr. Sanjak has extensive clinical, research, and organizational experience working with patients who have other neurodegenerative diseases such as Parkinson’s and Multiple Sclerosis. In the past, his clinical and basic research focused on understanding the pathophysiology of exercise, fatigue, and balance responses in ALS patients. In parallel, Dr. Sanjak actively participated in defining validity and reproducibility of standard clinometric measurements in ALS, including the Amyotrophic Lateral Sclerosis Functional Rating Scale, evaluation of muscle strength by computerized isometric muscle strength percentile normative data, and measurement of vital capacity. Dr. Sanjak has participated in multiple clinical research and clinical trial projects and assumed leadership roles in planning and executing numerous multicenter and multinational ALS clinical trials. *For the latest programming info, schedule, session and faculty details, and room locations, please see the Searchable Online Program & Scheduler and/or the ACRM App. Although significant changes are not anticipated, the schedules, sessions, and presenters posted on this website are subject to change. Copyright © 2018 ACRM | AMERICAN CONGRESS OF REHABILITATION MEDICINE. ALL RIGHTS RESERVED. Advertisements on this site do not constitute a guarantee or endorsement by the journal, association, or publisher of the quality or value of such product or of the claims made for it by its manufacturer.